I tend to be bit of a minimalist, but with a twist. I always like to see a quirky design element or just something a little different. That is why I like basic tops but with a funky design element. 2 days ago I showed you how to select fabulous tops that you can use as basics. Today I want to do the reverse and show you how you can also convert a basic classic skirt into something more funky and fashionable. The model for this exercize is the pink silk skirt I showed you yesterday. I have several skirts that have this funky design element incorporated into the design. My black skirt has push buttons on the site that allows you to easily lift the skirt on each side. Some of these desgin elements can be created with a wide skirt. 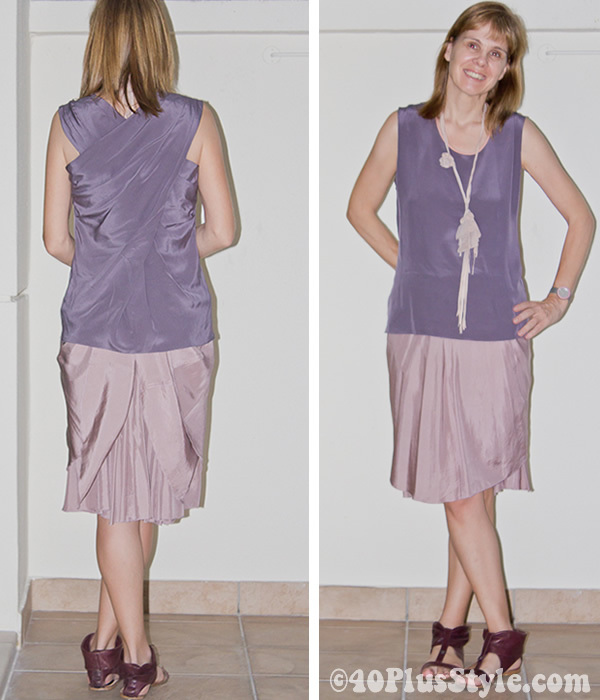 Have a look at this simple silk skirt and what you can do with it to convert it into a fashionable fashion item. 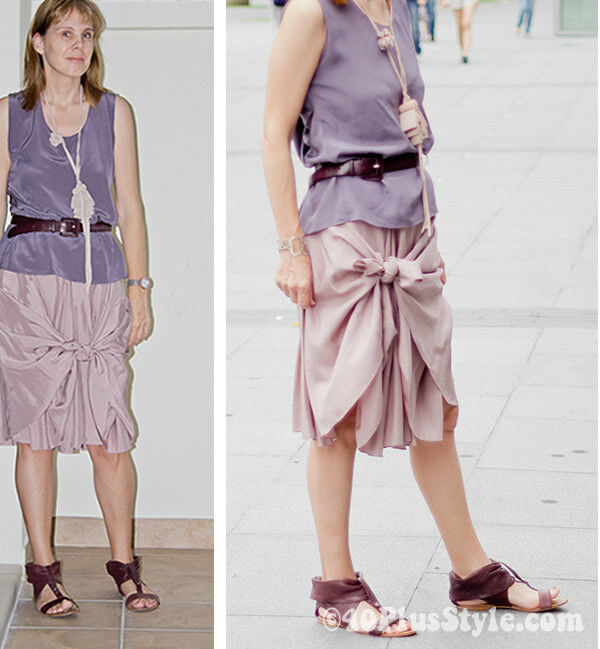 This is the simplest way to add a bit of spice to the skirt by just tying 1 knot on one side. Here the skirt has a a knot on each side. In this version I have tied both ends of the skirt around my back waist, which turns it into an elegant pencil skirt! This can create a nice effect as well and turns you classic skirt into a hot fashion item! So what do you think? Would you do this? Which combination is your favorite? Amazing! How very clever you are. 🙂 The knots make this skirt look like a different garment. I can not pick a favorite as they are each special. I do not have a skirt that is full enough to do this with but if I did I would be showing all of my friends this trick. I think the single side knot would be beautiful on a long black formal skirt. Then a part of your leg and a gorgeous evening shoe could peek out. Lovely! I think you’re right. That would work well! Very cool. Love the little knot on the side! Interesting. The most subtle change seems to be the most popular. Ooh, I love this! You are so creative. Thanks for the tips. I’m quite into knotting and semi tucking this summer. I think i have a couple of perfect victims! I do almost always get my clothes out the night before. Then everything (including accessories) gets hung together. The next morning is a breeze! Next post: Makeup for women over 40: Is it essential?